Drake has reportedly postponed the remaining three stops on his and Future's Summer Sixteen Tour, on "doctor's orders" following a recent ankle injury. Last week, Drake shared a brief note to fans, via the OVO blog, announcing that select dates would be pushed back. Today, a rep from his camp offered a second statement, confirming that the remaining tour dates, including stops in New Jersey, Philadelphia, and at Brooklyn's Barclays Center will also be postponed. "Drake suffered a severe ankle injury during the tour which he did his best to power through. By doing this, he made his injury worse. 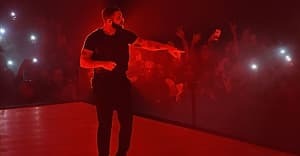 Under doctors orders and to ensure Drake only ever gives fans the performances they deserve, he will be postponing the remaining 3 dates of his Summer Sixteen tour to allow him time to recuperate his ankle injury. Drake's fans mean the world to him. Seeing their faces and performing his music for them is what he loves to do the most and he can't wait to get back on stage." No word on when the dates will be rescheduled to, but Drake did announce The Boy Meets World Tour today, a 26-show run through Europe and the U.K., set for January through mid-March.